2. In an electric mixer or using a hand mixer, add the cake mix, flour, pumpkin, water and oil. Mix for a few seconds to combine. Add the egg whites, egg, vanilla, cinnamon and pumpkin pie spice. Mix until blended. Turn mixer on high and mix until very smooth. Stop the mixer and scrape down the sides. Mix again for a few seconds. 3. Fill each mini muffin cup ¾ to the top. Sprinkle each with ½ teaspoon of rolled oats. 5. Let sit for a few minutes then carefully remove form pan. Cool. Continue to bake remaining muffins. 6. In a small bowl, mix together glaze ingredients. 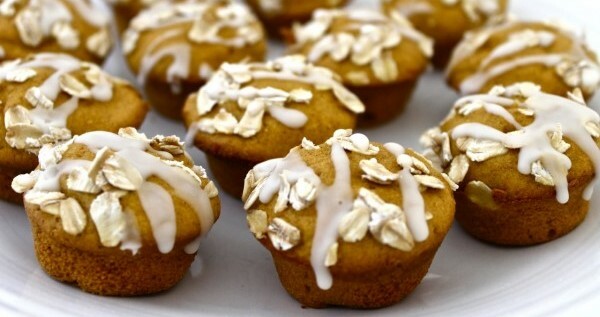 Drizzle each mini muffin with ¼ teaspoon glaze.